Louis Gustave Mouchel is remembered as the man who introduced 'ferro-concrete' to Britain. This was one of the most influential and far-reaching inventions to shape 20th century civil engineering. Mass concrete, without any reinforcement, was pioneered towards the end of the 19th century by Scotsman Robert McAlpine (1847-1934, baronet from 1918). 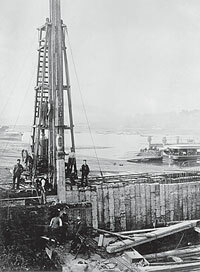 However, the technique introduced to the UK by Mouchel involved strengthening this concrete with steel or iron, a process that had been patented by his fellow national François Hennebique (1842-1921) but was further developed through his own business in the UK. Although an engineer himself, with an industrial background in coal and steel, Mouchel was first and foremost a businessman. 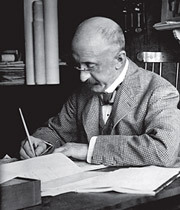 He established LG Mouchel in 1897 as an engineering consultancy, initially specialising in ferro-concrete. The business was immediately fruitful  Mouchel's first contract was to design retaining bank piles for a new sea wall in Southampton for the London & South Western Railway. The demand for ferro-concrete proved to be high. By the early 20th century it had become an aspirational and revolutionary material, representing modernity, strength and versatility. Mouchel was an anglophile with a passion for the British way of life, spending the majority of his adulthood living and working in the UK. Although he never lost his broad Normandy accent, he spoke and wrote English with perfect accuracy. In spite of his dedication to the British way of life, Mouchel was always aware that, to those around him, he was considered a Frenchman. An acquaintance of his once remarked, "But, you see, you are not an Englishman". "No", replied Mouchel, "but I am nearly as bad. I am a Norman." The company that Louis Gustave Mouchel founded in his own name  L.G. Mouchel & Partners, later known as simply Mouchel  became one of the largest technical consultants in the UK, and at the time of writing (2013) was a publically listed company. Mouchel's first commission as agent for the Hennebique system of concrete reinforcement was a retaining bank in Southampton, completed 1898. It made use of precast ferro-concrete sheet piles and the material proved ideal for maritime construction.